Come & stay in the building that launched Modernism in Palm Springs, Frey’s Kocher-Samson Apartment, newly restored to its original circa 1934 glory. This singular, private, rooftop apartment on North Palm Canyon Drive, with mountain views and the best seats in town for the Pride and Christmas Parades, has an A+ location in the heart of downtown, giving it a Walk Score second to none. Wonder Dog Management is a local team with a handful of employees who are available to assist guests day and night. If the office is closed we have an emergency hotline you will be able to call and get immediate assistance. We want to make your stay as comfortable as possible. This is the apartment that started the Modernist movement in Palm Springs and we believe we have restored it to its original beauty. Come and relax on the roof top patio and catch one of Palm Springs famous parades from the best view in town. 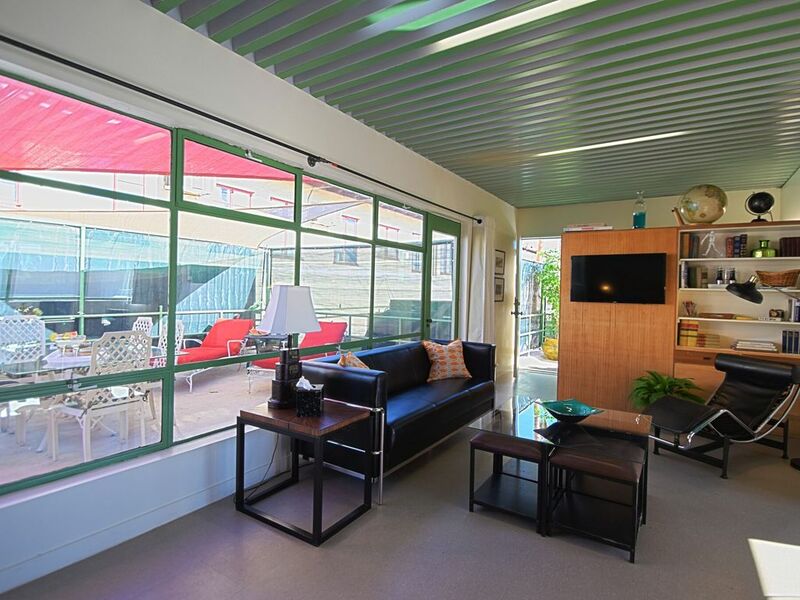 Roof top apartment, Mid Century Modern Motif, private gated entry, all restored to that 1930's beauty. Mini fridge, full stove, full sink, dishes supplies. This unit is a great location. It’s walking distance to restaurants and shopping. The unit is full on mid century vintage charm with a private balcony. If you have issues with your knees or climbing stairs then this place may not be for you. There is a spiral stair case that’s very small. The apartment was outfitted perfectly for one or two people. The pool area closed due to construction but was not all that important to me though might be a deciding factor for other vacationers. It was an easy walk to many good restaurants, shops and attractions. I decided against renting a vehicle this trip and didn't miss it at all. But, as another reviewer suggested, bring or purchase ear plugs for sleeping. The road noise from both Palm Canyon and Indian Canyon Drives is significant at night especially Thursdays thru Saturdays. It was fantastic to stay in this apartment designed in the 30's by one of the premier architects of the time. Though the exterior of building has lost the original appeal thru subsequent renovations, the upstairs unit ( judging by the black and white photos adorning it wall ) has remained faithful to the initial vision of Mr. Frey. Perfect location for traveling around PS. Quiet & easy to walk downtown. Everything you need. Tip - pull your suitcase behind you when going up the cool spiral staircase otherwise you’ll struggle. Also make a stop in downstairs to meet Harley the cat shopkeeper. And hit On The Mark for a gourmet sandwich & bottle of wine. The guys over there will treat you right! Definitely recommend especially if you’re an architecture buff! Great space in a great location. As this is a Frey designed apartment, it made my stay during Modernism Week that much better. The place was super clean and tidy. All the comforts of home. Plus, a great management team. I would stay there again. Perfectly situated to enjoy restaurants, shopping and the weekly street fair, this apartment is suitable for a couple or a couple of sisters! Very clean and set up with all you need for a comfortable stay. Be aware that access is via a narrow metal staircase.